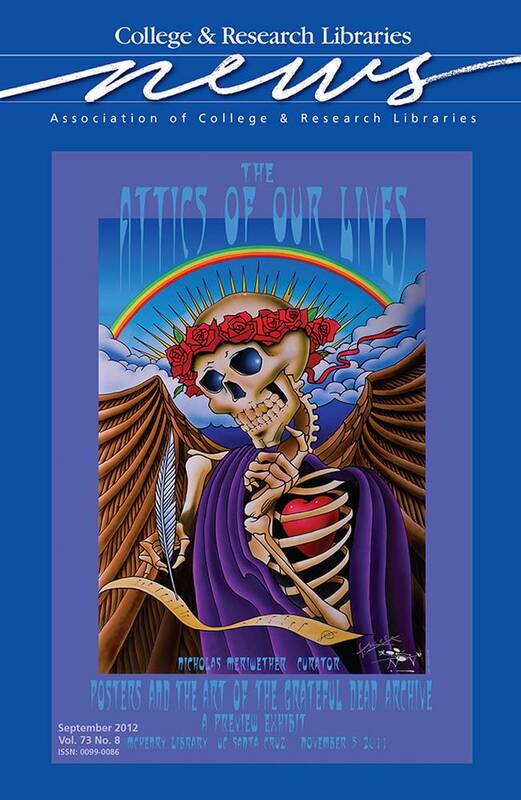 This month’s cover image is “The Attics of Our Lives,” a lithograph promotional poster for the Grateful Dead Archive at the University of California-Santa Cruz by renowned rock poster and album artist Stanley Mouse.Mouse’s work has helped define the Grateful Dead visually for more than 40 years, beginning with the band’s signature icon, Skeleton and Roses. When Archivist Nicholas G. Meriwether visited Mouse’s studio, he was struck by his sketch for the poster. “It was perfect,” Meriwether recalled. “A skeleton scribe, writing music in a garret; this was indeed ‘the attics of our lives,’ for what is an attic but an appropriately funky, Haight-Ashbury view of an archive?” Learn more about the Grateful Dead Archive on page 460 of this issue. © Stanley Mouse, 2011. Used with permission.